This leather wallet has a bit more of a sheen to it than our traditional leather wallets. Please also note that the surface, due to buffing, has a bit of a wavy look, but smooths itself out once cards and cash are in wallet. Features: 2 clear ID pocket with thumb-hole holds about 3 plastic cards 4 extra-wide pockets hold about 3-4 plastic cards each 1 large extra deep paper money compartment good for storage & more 1 deep paper money compartment for everyday use & all size international paper currencies 1 passport storage compartments. 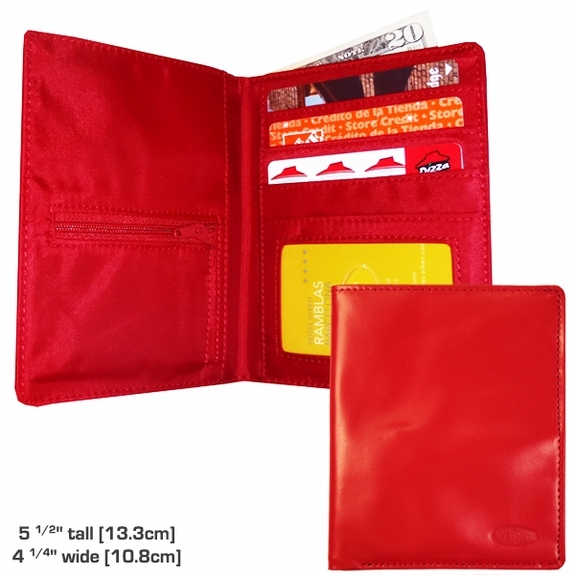 Can accommodate 2 additional passports in the billfold 1 exterior zippered change pocket full-grain leather on the outside & our unique durable, light-weight, water-resistant, nylon micro-fiber on the inside Dimensions: 4 1/2" wide x 5 1/2" tall (11.5 cm x 14 cm) only ⅛" (4 mm) thin when empty! We're very pleased with the passport wallet. We travel overseas nearly every month, and this wallet snugly holds 2 USA passports for my husband and I. Plus, there's room for our itinerary, some currency and credit cards. Yet, all this without taking much space. It's also well-made. We've used it regularly for over a year and expect to use it for many years to come. The glue was visible at the edges. The edges are not properly finished-very sloppy. The leather is top grain only-not the full grain leather listed under product description. Does not fit the large USA passport very well. Huge disappointment.